Think of a cell as one of the classic big bands and the proteins inside it as individual musicians. Just as it can be hard to tell who is soloing when you’re listening to a record, it’s also hard for scientists to tell which one of the gang of proteins is responsible for any one of the nearly innumerable intracellular functions. Shantá D. Hinton has been studying a particular protein, one that goes by the name of MK-STYX, for the better part of a decade. She will share her insights into this fascinating — and even mysterious — protein in William & Mary’s fall Tack Faculty Lecture. The event will be held Wednesday, Oct. 4, 2017 at 7 p.m. in Commonwealth Auditorium at the Sadler Center on the William & Mary campus. “Brain Dance” is the 12th Tack Faculty Lecture, one in a yearlong series of events at the university to commemorate the 50th anniversary of William & Mary’s first African-American residential students. Made possible by a generous donation from Martha ’78 and Carl Tack ’78, the Tack Faculty Lecture invites the community once each semester to hear William & Mary researchers discuss what they’ve been working on. 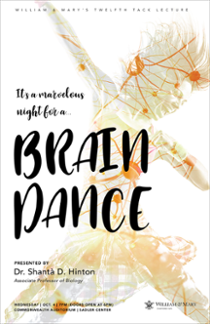 Attendees at “Brain Dance” will get an understanding of the role that basic research provides in the quest for cures and prevention of human disease. Hinton and the students in her lab have been working on MK-STYX, one of many, many proteins that biochemists and cellular-molecular biologists describe as workhorses of the cell. Hinton explained that proteins do intracellular jobs that range from providing the basic structure of the cell to keeping the replication/transcription/translation mechanisms of DNA and RNA running. In the mysterious world of proteins, MK-STYX is especially strange and particularly mysterious. MK-STYX is a member of a family of enzymes known as protein tyrosine phosphatases. It’s an important family: For instance, Hinton explained that one member of the protein tyrosine phosphatase clan regulates insulin. But, Hinton said, MK-STYX isn’t like other members of the family. “I work with a unique member of this enzyme family. It’s not an enzyme,” she said. Much like families named Smith or Miller, Hinton explained that the protein tyrosine phosphatases get their family name from their biochemical profession, which is to remove a phosphate group from one or another phosphorylated protein. In layman’s terms, these enzymes are like switches, involved in the activation, deactivation and modification of various proteins. But, MK-STYX is missing a key amino acid that allows the other members of the family to complete their dephosphorylation tasks. MK-STYX’s inability to complete this particular job makes it a kind of protein known as a pseudoenzyme or a pseudophosphatase. Hinton says the apparent lack of function among pseudophosphatases has caused puzzlement and controversy ever since their discovery. For a while, biologists assumed that MK-STYX and other pseudophosphatases were nonfunctional, mere artifacts of an eons-old mutation whose cellular function (if there ever was one) is long gone. Pseudoenzyme functionality continues to surprise researchers. Evidence of the role of pseudoenzymes to human health is popping up in labs all over the world. “We’re still learning,” Hinton says, and what she and her fellow researchers are learning about these proteins is tantalizing. And how about the Hinton lab’s focus protein? It’s shown itself to be anything but a dud. “For my particular pseudoenzyme, MK-STYX, what we know is it shows these beautiful morphologies,” she said. Hinton explained that MK-STYX, incorporated into a cell, will “grab on, hold on” and promote growth of neurites. Neurites are predecessor structures of axons and dendrites — the projections from neurons. In short, MK-STYX’s “beautiful morphologies” can cause even non-neuronal cells to begin to take on the characteristics of neurons. She cautions that “Brain Dance” attendees should not expect to see MK-STYX-based therapies anytime soon. That day can only come after clinical testing, and clinical testing can only come after Hinton and her lab does a lot more work.